One year ago I got fed up. I had had enough. After nearly five years of “trying” to get back to my pre-pregnancy weight i was at my heaviest weight since bringing Noah into this world. I was not satisfied with the look of my body but I honestly didn’t know what to do. The more I “tried” the more it seemed like I gained weight. I always thought it would be easier to maintain my weight once I became a stay at home mom. No more sitting in a desk eight hours a day. But all the running around after toddlers doesn’t erase all the snacks you find yourself eating with them and the secret pieces of chocolate you sneak into your mouth during nap times. Moms, you know what I’m talking about. I knew that my next step needed to be serious. I knew that this was a journey that I couldn’t do on my own because I can talk myself into eating any fun size candy bar, scoop of ice cream, or buttered biscuit. The next step that I chose lead me to losing fifteen pounds over the past year! I will be the first to admit to you that I was not overweight but keep in mind that I was not satisfied with the state of my body. But when you are 4′-11″… (one inch shy of needing a booster seat) fifteen pounds is a LOT of weight and requires diligent effort. Here’s how I did it. Yep, twelve months and a success story later and I have no shame in telling you that I followed in the steps of Oprah and joined Weight Watchers. The only difference is that my success story doesn’t include personal trainers and chefs helping me on my journey. My story is simply my life lived out normally while feeding and caring for my family of five. I’ve eaten out, vacationed, and occasionally splurged all while getting back to my pre-pregnancy weight and continually working towards my final goal. So how did Weight Watchers help me? It opened my eyes to that while I wasn’t eating a ton of food I was eating more than my body needed. Unfortunately, my small little frame just doesn’t need a lot of food. That fact is still a little sad because I LOVE food. But I’ve learned to just enjoy a few bites of everything instead of feeling the need to consume everything offered me. I have the Weight Watchers app and use it to calculate and budget my points for each day and week. I get a certain amount of Smart Points each week that I can use whenever I want. Generally, I save those for a special dessert sometime during the week. If I know that a party or big meal is coming up I’ll try to get some extra steps logged on my FitBit because it syncs with my Weight Watchers app and earns me extra Fit Points that can be used like Smart Points. The beauty of the system is that I honestly don’t feel like I have been denied anything. I’ve eaten mys share of sweets over the past year… they’ve just been balanced out with loads of fruits and veggies (0 Smart Points) and healthy cooked main meals. 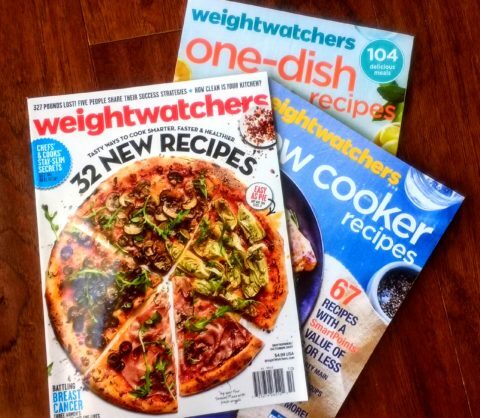 Weight Watchers publishes a magazine and cookbooks throughout the year. Most of the recipes that I have tried from these have been a huge success with my family with the girls begging me to cook some of them over and over again. I haven’t attended a single Weight Watchers meeting, instead I chose the online membership route. The catalyst that really got me motivated and opened my eyes to yummy treats like Halo Top Ice Cream is their social media platform Connect that is integrated into the Weight Watchers app. Connect is filled with encouraging people, success stories, and endless motivation. I’ve purposely taken time off from Weight Watchers while we were in China and during our Disney Cruise but it didn’t mean I wasn’t mindful of the food choices that I made. My go to meals for dining out are grilled fish and vegetables. I generally skip the salads and rolls because the dressing and wheat does nothing but eat up points that I would much rather use on something fun like dessert or an extra cup of coffee with creamer. I’m the final five pounds away from my weight loss goal and I’m here to tell you that these five will be the hardest I have to lose. Sometimes it’s not easy staying focused… especially now that I’m feeling confident in my body and loving how my clothes fit. I’m not giving up though and I don’t plan to stop using Weight Watchers once I hit my goal. Budgeting my food is the way to go for me. For years I have managed our grocery, clothing, and various other budgets for our household. I understand and love the concept of using only what you have enough for and saving for something special. Basically Weight Watchers speaks a language that I understand. It may not be for everyone but I love it! This entry was posted in Cooking, Family, Food and tagged diet, weight loss, weight watchers, weightloss on 10/20/2017 by Krystle. 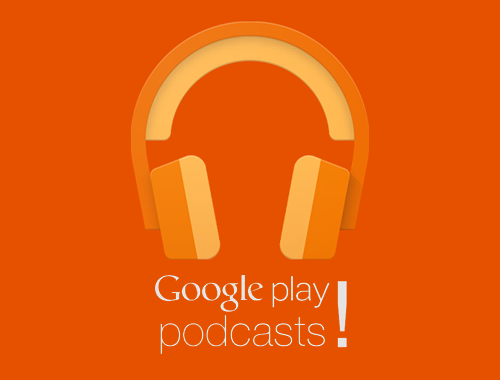 A few weeks ago when I was sorting through and pricing fall clothes to place in our local consignment sale I found myself with some free time on my ears and decided to check out this world of podcasts that I have heard so much about. 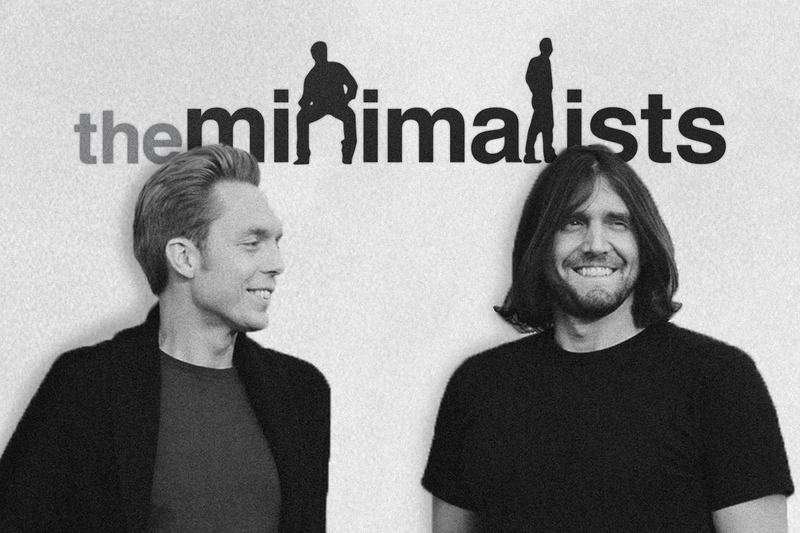 … The Minimalists. Early this year we stayed with some good friends of ours in Birmingham who had shared with us that they loved listening to The Minimalists. I remembered they shared with us how helpful it was to examine everything in their lives and ask themselves whether that item/task added value or took away value from their lives. Michael Luke and I have always had the desire to simplify our lives and cleanse our house of “junk” so I decided to check them out. The Minimalists are Joshua Fields Millburn and Ryan Nicodemus, two men who used to live it up with their corporate jobs, six figure incomes, more possessions than their jobs could afford, and hundreds of thousands of dollars in debt. After some major life setbacks they each realized that none of the things were bringing them true happiness and were in actuality cluttering their lives up. They stripped their lives down until all that remained were the essentials… the things that actually added value to their life. I’m talking major simplifying that involved “packing parties”, scanning documents and pictures to hard drives, and drastically reducing the size of their wardrobes. 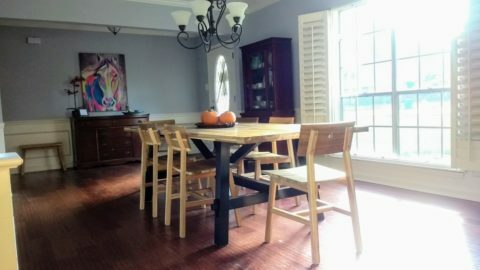 Now, I by no means see our family becoming super extreme minimalists but I have definitely seen the value in simplifying and over the past few weeks we have been evaluating everything in our lives to see what items add the most value to us and what steps we could take to simplify tasks around our house. For instance, we have hardwood floors downstairs. Michael Luke recently bought one of those automatic vacuum cleaners that cleans the floors for us while we are out of the house. It adds immense value to our lives because we don’t have to spend all that time sweeping the floors every day now. Something else that adds value is that we don’t have any rugs downstairs except for in front of the sink and in Judah’s room. This means that we don’t have to roll them back to clean underneath them or spend extra time vacuuming them with our Dyson. As a mom, why would I not want to make my job easier. Do we really need those items we haven’t used in more than three months? Is a collection of DVD’s we haven’t watched in years worthy of taking up drawer space? Isn’t a closet much less overwhelming when it only contains clothes that I love and I know look great on me? I’ve been purging toys, cleaning our drawers, and pairing things down. I took the place mats off the table that I thought made things easier but in reality they complicated cleaning up after supper. I had to wipe every place mat off after dinner and then pick them all up to clean the table from any loose crumbs afterwards. Sure the table looked pretty with the extra color but it wasn’t making my life easier. Now we eat and then the girls are able to use a damp towel to clean the table after each meal… way easier for me. Reducing the clutter and the amount of your possessions also provides more free time in your life because there is less cleaning. Which means less sounding like a not so fun mom who has to constantly ask her girls to pick their toys up. Our girls don’t have a boat load of toys but it doesn’t take much for any child to accumulate a stock pile of trinkets. Despite all their “stuff” when my girls play most days they end up creating many of their props needed for all their imaginary expeditions. Before we moved earlier this year we packed up nearly all their toys a few weeks before the big day. Never did they complain about having less toys. They just came up with new ways to play. They used their amazing minds and got creative. I really think pairing down our possessions and simplifying our lives is going to have such immense benefits and allow us to focus on what we as a family value most… each other and time together. It’s been fun examining our lives in a new light and reading about other families that choose to live a minimalist lifestyle. One thing I have learned over the past few weeks is that minimalism doesn’t have to look like concrete floors, bare walls, and a clean line sofa. Minimalism has many different looks and just may include a big comfy sofa, a bag full of Lego pieces, and a selection of dress-up clothes because all of these add value to our lives. Is anyone else out there living the minimalist lifestyle? If so, what resources or tactics have you found most beneficial? This entry was posted in Color Created Family and tagged minimalist mom, simplified living on 09/29/2017 by Krystle. Want to hear a story? Want to hear a 100% true story that could leave you in tears but praising God at the same time? Ok, good. Well, then let’s chat. But before you scroll any further I warn you… go grab a box of tissues. If you are reading this you are probably know that about four months ago we welcomed our third child to our family. Four months ago we traveled to China and brought home Judah. The most precious little two year old boy that I never imagined my heart could fall so hard for… but at the same time would lead me down a road with God that would cause me to experience a WIDE range of emotions and truly discover which parts of my life I wasn’t handing over to Him. When your child has nystagmus and low muscle tone you see a neurologist. It’s what you do. One of my frustrations with doctors and therapists for Judah has been their lack of experience and knowledge with and about international children. Medically, mentally, physically, and emotionally they are different and for the most part can not be compared to children who were born into a forever family. 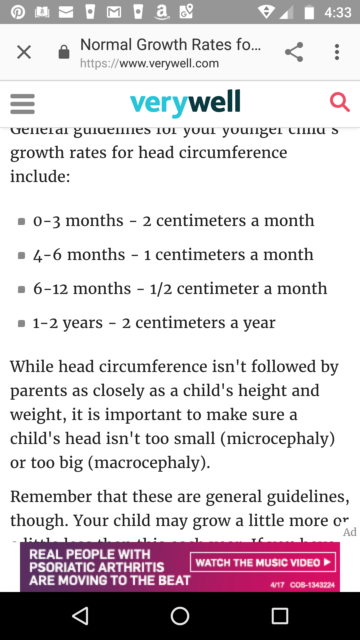 So two months ago when we made our first visit to Judah’s neurologist I wasn’t sure what to think of the doctor’s concern for Judah’s small size… particularly his head circumference which wasn’t registering on the growth chart for a two year old. His doctor was also concerned about his low muscle tone and thought that all of that plus the nystagmus could be the result of some brain damage. I’m not sure if you’ve ever had those words said to you about your child but for me it just about sent my body into complete shock. I mean, could my child not be small because he was malnourished? Could he not have hypotonia (low muscle tone) because he had possibly spent two years in a crib? Could his head not be small because the back of his skull is flat from so much time spent laid on his back? Well yes. The doctor felt any of these could be the reason or an underlying factor but because he honestly had no clue he felt we should have an MRI done on Judah’s brain. Judah’s head was measuring at 44 cm… 1 cm shy of being on the growth chart. He shared with me that he would not be as concerned if Judah’s head was 1 cm bigger. The MRI was scheduled for a month and a half later… because umm “hello” every mom is perfectly cool waiting that long to find out what is going on inside their child’s head. With not much else to do besides wait I decided to spend that month and a half praying for Judah’s head circumference to increase by 1 cm. In my mind I had a month and half to get Judah’s brain looking as good as possible for that MRI. I did research on foods that helped to promote brain development and immediately began feeding my baby eggs, nut butters, and fattening Greek yogurt. I don’t mean that low fat Greek yogurt stuff I mean the 300 calorie, 14 grams of fat per cup yogurt! It was time to get Judah loads of healthy fats. I also added a liquid DHA and liquid multi-vitamin to his diet. On top of that I began praying for him. That God would increase his head circumference to 45 cm by the morning of his MRI. I would not measure in the meantime but fully trust God that no matter the outcome it would all be for his glory. I prayed and prayed and really had to do a lot of self checking to make sure I truly did believe that God was bigger and greater than whatever Judah had going on. Through our month of half of waiting God really drew me closer to Him and prepared me for everything that was about to happen. June 29 was the day his MRI was scheduled for. The girls went to the grandparent’s house and we had a night out with Judah before his big day. 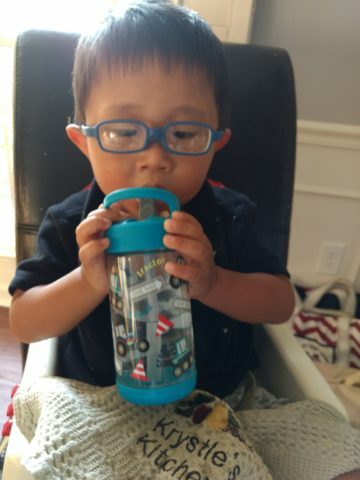 While he was sipping his “clear liquids” (apple juice) that morning I nervously pulled out my tape measure to check his head circumference. It had been hard waiting all that time but I didn’t want to falter in my trust of God. I even almost caved in and measured the night before but I knew that God could still be at work growing that little head and I was going to wait until June 29. I remember circling the purple tape measure around his precious little head hesitating a moment because of my own nervousness to see what the result was. Y’all! I kid you not his head circumference grew an entire centimeter in a month and a half! God had answered my prayers and calmed my heart on the morning of such an important day. To me it was His way of telling me everything was going to be ok. I was ecstatic and felt ready to handle whatever information the MRI gave us. Just so you can see what a huge deal this is and how awesome our God is take a look at the growth of the average child’s head per month/year. The day continued on. We went to the hospital. I finally convinced the nurses it was a TERRIBLE idea to stick my son with an IV and then attempt to put him o sleep. Finally, they felt like my idea to knock my terrified and traumatized son out with gas might work best. In the end, we left the hospital shortly after lunch and all went home to wait on the result that we were told we would receive the next day. The next day came and went and so did 14 days after that and still no word on the results of the MRI. Michael Luke called for the third time and a little while later the neurologist called us to talk about the MRI. Michael Luke had just pulled into the carport and was able to put the phone on speaker so that I could hear as well. You would think that in all the learning that doctors do that somewhere there would be a course, one day seminar, or five minute closing lecture on delivering bad news prep… but I’ve yet to see the results of that. About five seconds into our phone call the doctor told us that it was just as he suspected… Judah had brain damage. He went on to name the parts of the brain that showed damage but I didn’t really hear because a) I don’t speak medical terminology and b) my auditory hearing kind of shut everything off after the words “brain damage”. I mean wouldn’t yours? He wouldn’t tell us the extent of the damage because like every good doc we needed to come in for a follow up appointment for that pertinent information. The phone call ended and Michael Luke seemed almost excited about the news. You know why? It’s just amazing the way our God plans things. That entire day Michael Luke had been in a CEU course about neuroplasticity of the brain in children! All day he had heard story after story of children similar to Judah overcoming their setbacks and challenges and taking the world by surprise through therapy. So how does it work in lay man’s terms. Basically you find out the part of the brain that is damaged and you teach the part of the brain closest to it to do the job of the damaged part. It’s like calling in the replacements. Yeah, it takes a lot of work and means that the road to reaching milestones is longer than the average child but also that our expectations for him should not be cut short. Amidst my shock I was also encouraged. I was encouraged because I am well aware that it could be far worse. I was encouraged because God given me hope when he increased the size of my baby’s head circumference. I was encouraged because leading up to this news God had placed key people in my life who had children who had overcome brain damage and are thriving in life now. People who have walked this road before me but are well aware of what it feels like when you are still in the trenches. In a way our future began to look different. It wasn’t exactly the path I would have voluntarily chosen but every step of the way I have know God is in control and lead us directly to Judah. Nothing changed about Judah that day. He’s still the same adorable boy that we met back in March. He’s the little boy that I never knew my heart longed for. I don’t feel like the orphanage gave us misleading information. I don’t regret following God and choosing him. He’s mine and I love him and will do everything I can to care for him, advocate for him, and help him develop to his fullest potential. He didn’t ask for this to happen to him but he is made in the image of God and I absolutely love him. 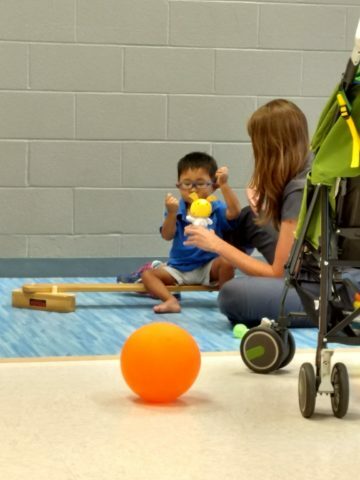 A week ago we traveled to Nashville three hours there and back for a spur of the moment very important physical therapy appointment with the lady who had taught ML’s course on neuroplasticity in children. After witnessing the way that she immediately calmed down Judah who lives in a state of almost constant panic as a result of trauma I decided to refer to her as the Cesar Millan of babies. Turns out that to help Judah overcome all his hypotonia we need to work to wake his body up. This pretty much involves being rough (in a sense) with him. Quite possibly because so much of his life was spent in a crib his brain doesn’t process and feel a lot of the basic touches to his skin. He needs deep pressure applied to him and for us to rub him roughly all over. If you see us out and about you may even notice that we have begun to squeeze and massage his hands and legs and to pound on his back. He enjoys the feeling of that and it helps to calm him down when he is around peopel. Overtime it will help to “wake” his body up and help him respond to softer touches and also help him control and have more use of his limbs. I felt so empowered leaving that appointment knowing that we were in the beginning stages of remapping and rewiring Judah’s brain. Despite my motivation to help Judah overcome all the obstacles that lay before him I DID NOT want to know the results of his MRI. Mainly because I didn’t want to hear any negative comments the doctor might say or his predictions for the future using only the medical knowledge he had without the understanding of the power of therapy and prayer. Michael Luke and I had even discussed that I would not go to the next neurology appointment. He would go to find out the extent of the damage and I would continue on championing Judah working with him to reach life to the fullest. 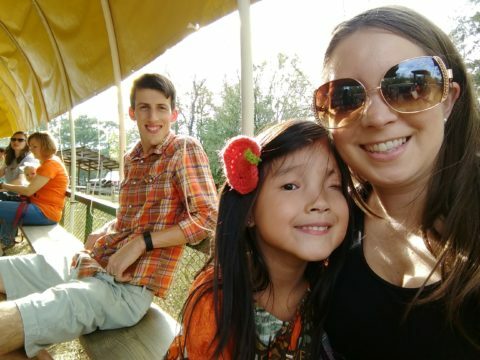 After an incredibly terrible experience with our pediatrician the first week home from China we decided to find a new doctor who like us believes in holistic care, a healthy diet, natural solutions to life’s problems, and had experience with internationally adopted children. Enter Dr. Blake Bergeon. Not once did he utter a negative comment about my child. He didn’t ask to see the milestone questionnaire that Judah failed 100%. He took Judah for who he was and mapped out the action plan from there. There is so much to share about our visit but I’ll stick to the highlights. First off he wants to double up on Judah’s speech therapy so that he can learn to communicate with us and hopefully eliminate some of his frustrations. Next, he shared with me that Judah has grown FIVE inches in four months, gained three pounds, and added another half a centimeter to his head circumference! My heart was overflowing. But on top of all that I mentioned the MRI to him just to make sure he knew about it and he mentioned that he had looked over the report but wasn’t too concerned about it because there wasn’t any mass areas of brain loss or damage… just some white matter damage in several spots around the brain that probably happened from a lack of oxygen during the birthing process. He shared all this information before I even got a chance to tel him that I didn’t want to know. You know what though? I’m glad I found out. I’m glad because I don’t have to live in the fear of the unknown. I’m glad because the doctor shared with me stories of success that other international adoptive children have had that have also had white matter brain damage. I’m glad because after everything my fear has dreamed up white matter damage seems small. I walked out of that appointment on cloud nine. Monday I might have possibly been the only person on this planet praising God for white matter brain damage. Judah has a long road ahead of him but one thing I know is is that that road looks pretty promising. 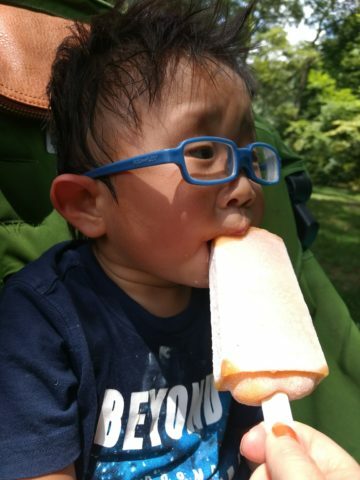 Next Tuesday my little boy will turn two and half and still will not be crawling, talking, or fully feeding himself but I happen to think he is pretty smart because he’s making progress every day. He’s also brave. I can’t even begin to imagine everything he has been through. From being abandoned, to living in an orphanage with limited interaction, to having your world ripped out from under you with out any warning…. no wonder life and people are terrifying to him. But he’s overcoming all odds. He survived and fought for his life the first two years and now his is learning to grow and thrive. He’s a fighter and so am I and with the help of God I know the sky is the limit for my little one whose name means “His Praise”. I’m well aware that this journey won’t be easy or short. Some days will be completely frustrating but isn’t life like that with kids. But in the end I know I will look back and clearly be able to see the hand of God at work within our lives and I will give Him all the praise that is due him. 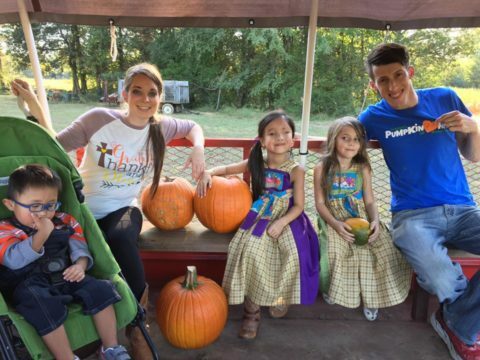 This entry was posted in Adoption, Family and tagged adoption, china adoption, International adoption, lifeline adoption on 07/26/2017 by Krystle.